Padosan (lit. "female neighbor," i.e., "the girl next door") is a simple-minded, warm-hearted slapstick comedy that doesn't ask much of its audience, and doesn't really offer much in return. At its heart is a dim-witted hero, his cadre of even stupider friends, a pouty, vapid heroine, and a passel of broadly-drawn stereotypes that are unfortunately more mystifying than amusing to a non-Indian viewer like me. Simple-minded Bhola (Sunil Dutt), after reading religious philosophy, decides that at twenty-six years of age, he should be starting a family. Casting about for a suitable girl, Bhola's eye lights on the lively young Bindu (Saira Banu), and he is instantly smitten. He soon discovers, to his delight, that Bindu lives next door to Bhola's aunt, with whom he is staying, and his bedroom window opens directly opposite Bindu's. Bhola's initial attempts at courting Bindu are not terribly successful, though, so he turns for advice to his friend Vidyapathi (Kishore Kumar), a spastic, paan-chewing theater director. Noting Bindu's love of music - Bhola's main competition for her attention is Bindu's excessively amorous southern dancing-master, Pillai (Mehmood) - Vidyapathi hits upon the scheme of hiding beside the window and singing, while Bhola performs in lip-sync - just like a film hero. This does get Bindu's attention - at least for a while. But there is still the dancing-master to contend with, plus Bhola's hale and hearty uncle (Om Prakash), who, unbeknownst to all, is working with a marriage broker to arrange his own match with Bindu. Padosan's hero is aptly named - "Bhola" means guileless or innocent - and though he is almost insufferably stupid at first, as the film wears on his naive sweetness does grow on the viewer just as it grows on Bindu. The best parts of the film are the songs, a bright and clever collection of early R.D. Burman melodies. 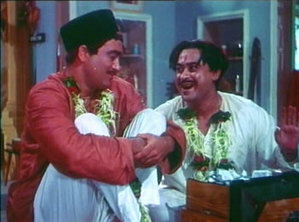 The couple of songs in which Vidyapathi backs Bhola's performance (like "Mere samnewaali khidki") are a charming send-up of the Bollywood playback convention; there is a pleasant self-referentiaity in a tune sung by Kishore Kumar, picturized on a Kishore Kumar character, who is singing it for someone else to perform. The other standout songs include "Ek chatur naar", a hysterical musical duel between the dancing-master and Bhola (well, Vidyapathi) that pits Carnatic against the north Indian style, and Saira Banu's cheeky bathtime frolic, "Bhai battur". Beyond the songs, though, Padosan isn't really for me. Much of the humor derives from broad stereotyping - the exaggerated accent and mannerisms of the Tamil-Brahmin dancing-master, the paan-juice perpetually dribbling down Vidyapathi's chin, Bhola's uncle's Rajput pride - that is largely lost on me. The rest is of the shouting-and-slapstick variety of Indian comedy that is not much to my taste. The result, I fear, is that much of what is side-splittingly funny in Padosan is just lost in translation. And from a purely superficial perspective, neither the hero nor the heroine are particularly nice to look at. It was fun enough while it was happening - and the soundtrack is definitely a keeper - but it's not a film I expect to return to again and again.